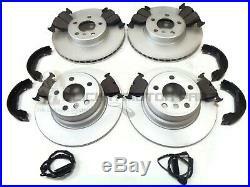 BMW X5 E53 3.0i 3.0D DIESEL 4.4 FRONT & REAR BRAKE DISCS & PADS SHOES + SENSORS. Vehicle Fitment & Product Information. X5 (E53) 3.0, 3.0D, 4.4 Models fitted with front 332mm and rear solid brake discs. Front Disc Type / Size. Rear Disc Type / Size. 2 Front And 2 Rear. 4 Front And 4 Rear. Brake Pad Sensors In Set. 2 1 Front, 1 Rear. Please read full listing description carefuly before you order to make sure the part does fit your car. BMW X5 E53 3.0i 3.0D DIESEL 4.4 FRONT & REAR BRAKE DISCS & PADS SHOES + SENSORS. The item "BMW X5 E53 3.0i 3.0D DIESEL 4.4 FRONT & REAR BRAKE DISCS & PADS SHOES + SENSORS" is in sale since Saturday, August 4, 2012. This item is in the category "Vehicle Parts & Accessories\Car Parts\Brakes & Brake Parts\Brake Discs". The seller is "clickamotorpart" and is located in UK. This item can be shipped to United Kingdom, Ireland, Germany, France, Italy, Spain.